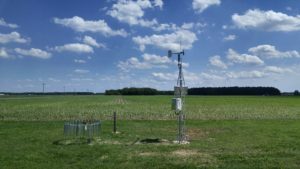 Since 2004, the Delaware Environmental Observing System (DEOS) has been providing real-time meteorological and hydrological conditions throughout the state of Delaware and nearby counties in surrounding states. DEOS stations measure many meteorological variables every 5 minutes, which are then transmitted to central servers at the University of Delaware for dissemination to the public via its website and other data services. DEOS supports emergency management, transportation, agriculture, energy, and natural resource interests throughout Delaware with numerous analytical products and services.